When it comes to weddings, flowers are a must! Whether your style is romantic and moody or bright and unconventional, flowers will enhance the feel and experience of your big day. However, they can come with a big price tag and as a bride, you are not only creative, but budget savvy too! You are more concerned about the experience of your friends and family. You want to create memories that will last a lifetime. So your wedding flowers should do the same! Below are some of our tips for the alternative bride taking on her wedding flowers one bloom at a time. Decide where you want to WOW your guests when it comes to flowers. Is it your bouquet you want to make a bang or maybe your head table centerpieces? Or maybe the arch for your ceremony? Spend the money on these ticket items and keep everything else super simple. Simple eucalyptus makes a great table runner. Add in some single stem bud vases from a local thrift store and bam your tables are complete. This is a budget conscious way to elegantly dress your tables and your guests will be sure to notice the attention to detail. When working with sustainable blooms like billy balls, lavender or thistle, it makes prepping boutonnieres ahead of time a breeze. These items dry really well and can be out of water for 1-2 days if refrigerated. We know you love your bridesmaids. They are your besties from high school, college and possibly your future sister to be! But let’s be real, it makes no, capital NO, sense to spend a bunch of money on bridesmaids bouquets. They just need them to walk down the aisle and for those group pictures where you are all trying to jump in the air at the same time. Plus you are the showstopper, spend the benjamin’s on making your bouquet first class. Using flowers like hydrangeas make their bouquets look fuller than they actually are, saving you time and money! (One hydrangea only cost $3-$5 per stem). If you don’t want to skimp on your ‘maids blooms, then get resourceful. Create their bouquets in a way that you can utilize them as centerpieces at the reception. You can simply set empty vases out on the tables and after the pictures are complete your bridesmaids can easily clip the ribbon of the bouqs and place them in the vases. Voila, you now have centerpieces! 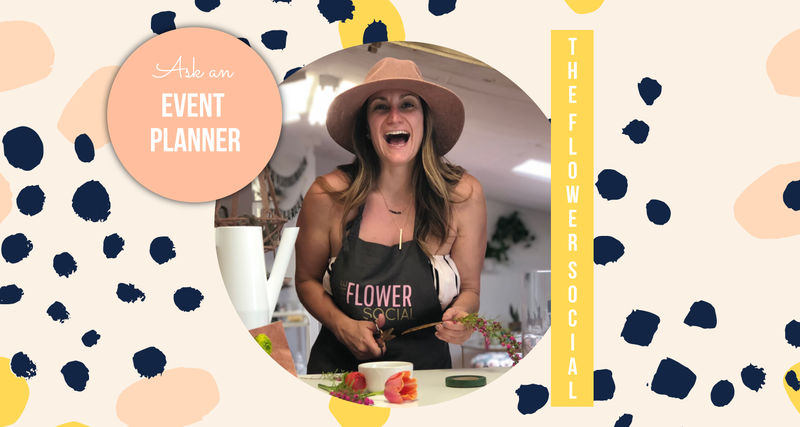 Join one of our classes and we will show you how to easily cut the ribbon and tape on your bouquets to quickly transfer them to stunning, unrecognizable table arrangements. Not sure what’s in season for your wedding or the name of that flower you love so much? One of my favorite Apps is http://www.flowerwheel.com/. It has over 500 flowers with photos, descriptions and the ability to save and email to others. Using this app will make wedding flower designing and ordering a breeze if you are taking on your own wedding flowers. Get Creative and ask for help! The best thing about being a creative bride or groom and making the decision to do your own wedding flowers is that you get to be creative. You also need help, so you enlist the assistance of your friends and family. Flowers are about connection. And everyone from your little niece Suzy to your 80-year grandma Pearl can help out! Make it a flower event to remember! (We help with that too, if you want to check it out on our site). We hope these insider floral tips make your wedding flower arranging that much more enjoyable. Cheers to you and congratulations on the big day!